Shane Spencer grew up in northern British Columbia. His background includes logging and construction but also mountain safety and guiding. “I spent a lot of time working around industrial projects as a mountain safety avalanche technician,” he said. “I switched gears after witnessing an industrial accident. 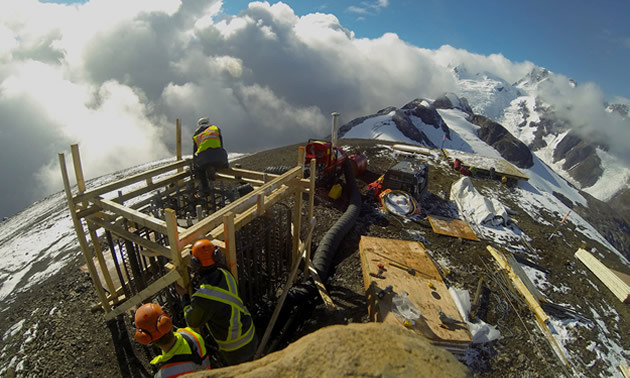 I moved away from the construction crew and into mountain safety work.” Although he has been drawn back to construction, he has put his mountain safety skills to practice with the foundation of Axis Mountain Technical. Ryan Foster’s work experience followed a similar path of logging and construction. Foster and Spencer met in university in 2000 and continued to work together for years afterwards. “He was the guy in my class that I connected with,” said Spencer. “We always knew that we would do something together, we just never knew what." “We came from similar backgrounds: small communities and hard-working families,” Spencer said. “You can recognize those people as problem solvers, innovators.” Axis Mountain Technical recognizes values like these. 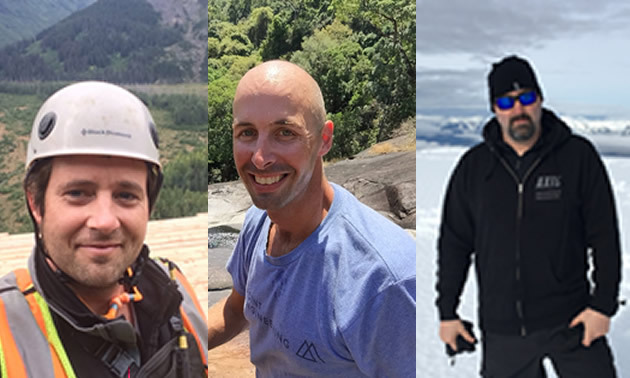 Four years ago, Spencer and Foster used their experience to create the perfect job for them: Axis Mountain Technical Inc. “We moved from working for contractors in industrial operations challenged by mountain environments to doing the jobs ourselves,” Spencer said. Their personal values and work experience fit together. “We became an all-encompassing construction company,” said Spencer. Matt McGee recently joined as a partner in Axis after connecting with Spencer on their kids’ soccer field. “Our wives introduced us,” Spencer said. 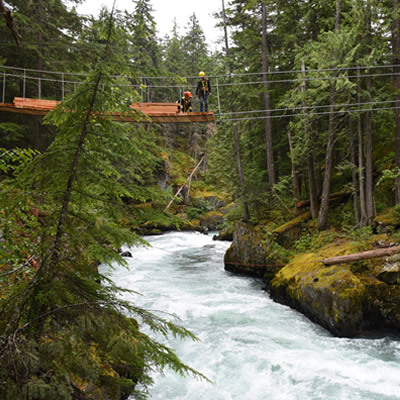 “We connected over industrial project talk and found out that we had similar backgrounds and values.” McGee grew up in Revelstoke and followed a similar path in logging and construction as an engineer with experience on mountain landscapes. Their strong work ethics and small-town attitudes prepare these three for anything the elements of British Columbia throw their way. “We are handed projects that are problems,” said Spencer, “ones that other construction companies aren’t interested in. 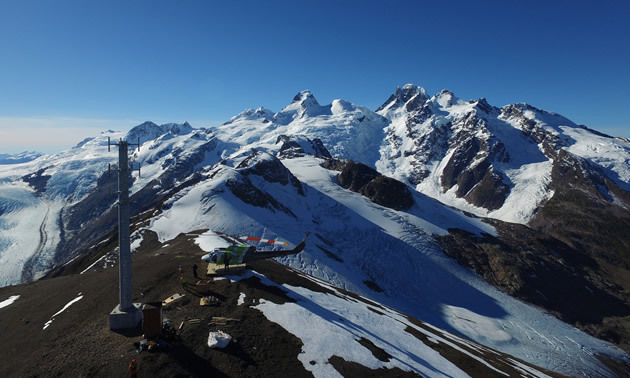 They're either in a rough place, require helicopter access or are just hard work.” The weather, however, is typically the biggest challenge of any job. About 80 percent of their jobs in the past year included a morning helicopter commute to the job site. While flying to work in the mornings, they’ve developed relationships with the pilots. “We have a high level of trust in those guys, and they have a high level of trust in us,” Spencer said. They’ve brought together a variety of working backgrounds to form their team, which they attribute much of their success to. Hard work is an understatement of what is necessary to work with Axis Mountain Technical. “Our team knows that we have them high on the list of what gets taken care of first,” said Spencer. “People view us as having a high degree of integrity.” McGee added, “We care.” The team comraderie and similar work ethics help as well. The Axis team has formed lasting bonds with mining companies, including Pretivm Resources Inc. through their work on the Brucejack mine. Spencer worked on the project personally in 2008 before co-founding Axis. 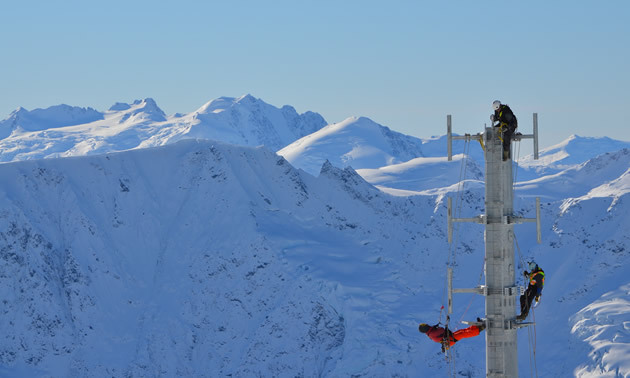 “The big kickoff job for us was putting in a microwave site for the high-speed Internet link from Stewart, B.C. We put in five mountaintop towers,” he said. 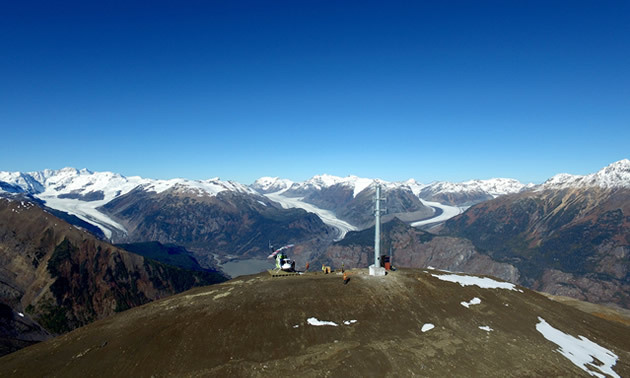 Axis was also part of an international team that installed six remote avalanche control exploders on Brucejack’s main access road. The project took two years and “was one of the most difficult installations of this system worldwide,” Spencer said. Axis was founded on a strong understanding of the mountain environment. This team knows what it takes to move mountain-based projects forward. Axis works with the challenging mountain landscape and offers services from design through to completion. Their team bridges the gap between safety and construction teams. Axis has formed international partnerships with equipment suppliers, industry experts and engineers in an effort to bring the best practices to their job sites. Their slogan, “We move tough projects forward,” continues to be the basis of their success.